There comes a time when driving home from work during that evening, bumper-to-bumper traffic that a Church sign catches your eye. Normally, you just keep traveling at 65 m.p.h (“Miles Per Hour” – for you non-Americans) in that 45 m.p.h zone, but since traffic has slowed you down to 25, you take the time to read the eternal words of wisdom from that Church sign. Once you read it, a few judgmental thoughts might come to mind. One, you wonder if it took them a long time to come up with that clever, analogous poem. A different thought could be that they would have been better off stealing that clever poem from the other Church down the road. Or the other thought might be something completely random; because the bible verse on the billboard about ‘living bread’ made you wonder about what you are going to have for dinner tonight. So what’s the point here? 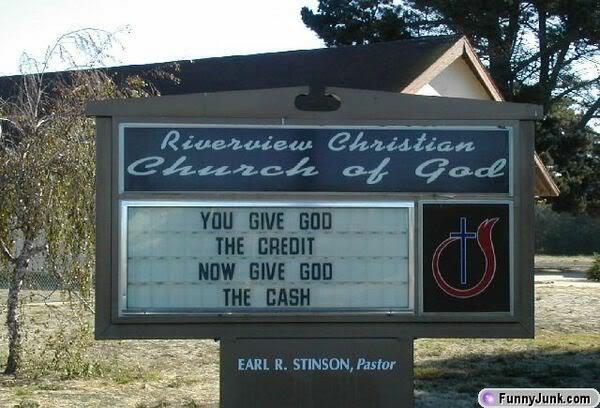 I don’t know either, but i want to cover 4 different types of church signs that you’ll see about giving money and tithing. Mama said, no religion and politics at the dinner table, so that gives you the liberty to turn your car into a political and religious motorized billboard. I gotta say this is kind of my favorite. At least i think it’s the funniest. Yes, i vote republican, and no i wouldn’t dare put a bumper sticker on my car or a yard sign in front of my house. Although i am proud that i vote conservative, i do not like to instigate anyone to vandalize my property. – I wonder if that kind of seems like a threat? -I wonder if their ushers pack any firearms under their suits? – I wonder if it’s God that needs the cash or if it’s Earl R. Stinson? – I wonder if he takes credit card?
. . . 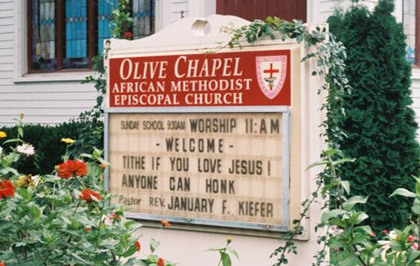 Anybody know of any other good Church signs? . . .
Those signs are funny. 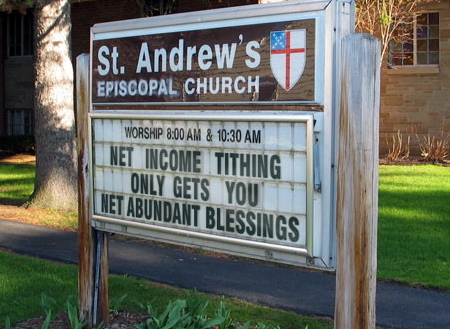 For a change, I would like to see a church sign that speaks the truth about tithing and lets Christians know that God/Bible does not require them to tithe. But I’m not expecting that sign anytime soon. You are missing the point…God calls for the tithe as a symbol of trust and fellowship with Him. It’s a hearth thing, if you are offended by the tithe–you have a heart issue between you and God. My former “pastor” brought counsel to my wife to leave our 20+ year marriage; he’s not just satisfied with his 10% cut (tithe is what he calls it. He also wants 100% of her labor plus 15% commission of my wife’s artwork and demands that she register with the State to get a tax number. This man is evil. Pray for our family. This is a church discipline problem, not a tithing problem. So many people back away from confrontation at the expense of the church’s reputation. ANYONE who brings disgrace upon the body of Christ needs to be addressed (scripturally) by individual, by two, and then brought before the church. We don’t like to have ugly displays within the church, but maybe if we address sin within the church like we are told in the Bible…we would not have as much sin from so-called Christians. I don’t find the humor in those signs. They have a negative connotation on me. I agree with the first post….that God does not require churchgoers to tithe. Tithing is done according to how open our hearts are to giving to our particular churches. I find lots of humor in the signs….in fact they are blunt look at what we should be doing. New Testament–God loves a cheerful giver (does not say the tithe is no longer required). Old Testament (Malachi 3:8) says we rob God when we do not tithe and give. People expect the church to meet needs in the community, provide a place for them to come and feel good about themselves because they went to church–but refuse to help with the expenses required to pay property taxes, heating/cooling cost, water, etc. People don’t want to be accountable for their sin, their money, their actions…so its not a surprise when people are offended when confronted in an area they are guilty. 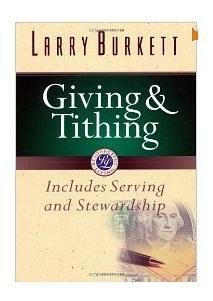 I absolutely agree that pastors must teach their congregation to tithe. it is not only something God commanded, it honors God (where your money is there your heart will be also), it is right for the members of a church to tithe in order to support the church, (but hold the pastor accountable to make sure they are not lining their pockets but actually using the money for the kingdom of God) but this signs are not right, outside the church should be place more concerned with bringing the people to God and then once they are Christians for a while then that is when they should be taught to tithe. this signs tell me this pastors are more concerned with money more than actually bringing sheep to Christ.